You just never know what is cursing below your water line. pictured here is the Sheerline models Russian “Akula”. it is scaled to 1/96th In real terms that makes her about 44″x5″ and has a really nice turn of speed. Nick the owner of this sub is a very knowledgeable and a keen submariner. He keeps us surface modellers on our toes when he is out on patrol. You never know where he is going to turn up from the depths. Nice model Nick. 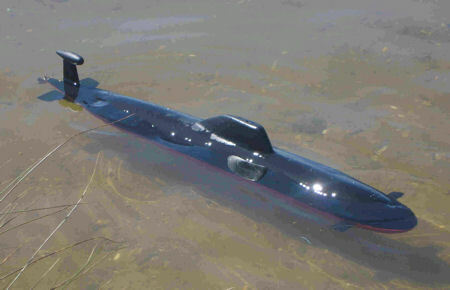 Here we have Nick’s beautiful American Gato class submarine built and modified from a Revell 1/72″ scale plastic model kit. She is only a Surface runner but looks the part in and out of the water.